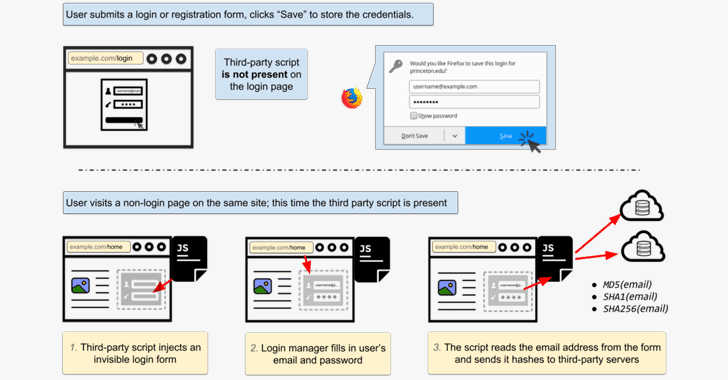 "Login form auto filling in general doesn't require user interaction; all of the major browsers will autofill the username (often an email address) immediately, regardless of the visibility of the form," the researchers say. "Chrome doesn't autofill the password field until the user clicks or touches anywhere on the page. Other browsers we tested don't require user interaction to autofill password fields." "Email addresses are unique and persistent, and thus the hash of an email address is an excellent tracking identifier," the researchers said. "A user's email address will almost never change—clearing cookies, using private browsing mode, or switching devices won't prevent tracking." Researchers have also created a demo page, where you can test if your browser's password manager also leaks your username and password to invisible forms.